8 m high monument made ? ?of Saaremaa dolomite. 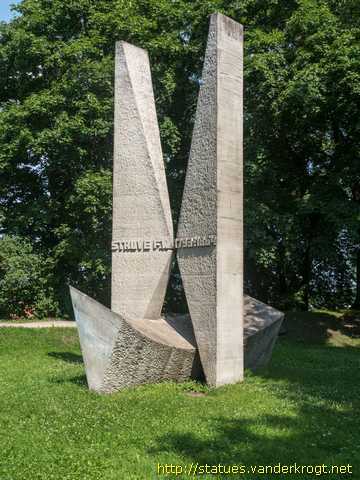 The lower part of the monument symbolizes the cylindrical sundial, the vertical part resembles an hourglass. Struve established in the years 1816 to 1855 the so-called Struve Geodetic Arc, a chain of survey triangulations stretching from Hammerfest in Norway to the Black Sea, through ten countries and over 2,820 km, which yielded the first accurate measurement of a meridian, and was used to establish the exact size and shape of the earth. At that time, the chain passed merely through two countries: Union of Sweden-Norway and the Russian Empire. The Arc's first point is located in the old Tartu Observatory, where Struve conducted much of his research. The architect of the momument is U. Ivask. Olav Männi (1925-1980), Estonian sculptor.